Behold, one of the greatest oven manufacturers on this wonderful planet of ours has bestowed the feature rich HB678GBS6B upon us. The days of unintelligent appliances has come and gone, and today the age of the smart home is here. Let’s hope it sticks around for a while! To make full use of the “smart” moniker, Siemens has gifted us the miracle of HomeConnect. This allows for a multitude of incredibly useful situation, including the ability to start the pre-heating or even full cooking process remotely. Coming home late from work and need to get a head start? Simply pre-heat the oven to your desired temperature ready for when you arrive. This HB678GBS6B multi function single oven with stainless steel visual appeal boasts a most impressive 15 functions for cooking, and a full colour TFT touchDisplay for selecting these options. It really is the ideal marriage of form and function; speaking of which, the handy softMove feature gives a touch of elegance to the boring task of opening and closing the door. No more slamming shut! 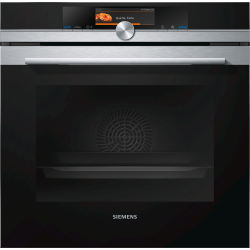 Sunday dinner just got a whole lot easier with Siemens’ stupendous roastingSensor Plus, which monitors the core temperature of whatever you’re baking. This allows for perfect results every single time, even when you’re out of the room not paying attention. The same goes for the bakingSensor function, which monitors the internal moisture conditions and controls the entire process automatically. Very cool.